Simple crafts for the elderly not only help with maintaining mental stimulation, but with a sense of accomplishment as well. Unfortunately, many older people suffer from physical limitations, such as poor vision and arthritis which limits their ability to use their hands. However, these simple dog crafts and diy crafts are designed in such a way that physical strength or attention to fine detail is unnecessary. Making homemade dog biscuits does not require a person to be a master cake baker or cake decorator. The recipients of the baked fare, the dogs, really do not care what the final delicacy looks like. Giving an older person a chance to contribute to the community and be useful may be the best gift you can give him or her. Let them help to make homemade dog treats and donate them to a church or a dog rescue for a fundraiser. 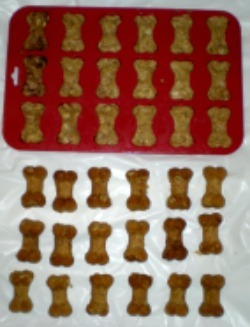 These mini dog bones were pressed into the silicone mini bone cake pan. The biscuits were made from a pre-made biscuit mix to which a few kitchen ingredients were added. If someone has arthritis in their hands, they made need help with mixing the dough. But that only takes a couple of minutes! Then, they can easily scoop up dough with their fingers and press it into the bone shaped molds. 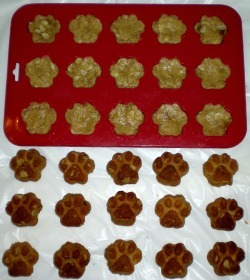 A paw shaped silicone cake mold was used. 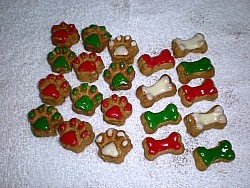 Again, with a minimum of help, the older person can press the biscuit dough into the paw shaped molds. Of course, it does not have to be perfect, and no matter how much dough they are capable of getting into the wells, a biscuit will still be formed! This dog treat icing just requires the addition of water and to be stirred. The older baker can simply choose to dip the biscuits into the icing, or "paint" the icing like in the photo. Again, it does not have to be perfect and dog bakery ready! Dogs are not picky about how their treats look. The artistry is for the humans. So, just go ahead and bake. The silicone cake pans make dog treat crafts for the elderly easy and possible because a dog bone cookie cutter is not needed, which does require agility with the hands to manipulate.